Lowell Greer holds a unique place among the hornists of his generation. Known for his musicianship and versatility with or without valves, he has received critical acclaim and international recognition as an orchestral hornist, chamber musician, soloist, educator, and horn maker. A Wisconsin native, Lowell began violin studies at age 4 and took up horn at age 12 due to a hand injury. His parents, both college professors, changed jobs several times, so Lowell had many horn teachers, the most notable being Ernani Angelucci of the Cleveland Orchestra. Lowell returned to Wisconsin to study with John Barrows at the University of Wisconsin and then pursued studies in Chicago with Helen Kotas, Frank Brouk, Dale Clevenger, and Ethel Merker. While in Chicago, he freelanced extensively, performing with the Chicago Civic Symphony, Lyric Opera of Chicago, American Ballet Theatre, Joffrey Ballet, shows, recordings, and as extra horn with both the Chicago and Milwaukee Symphonies. Lowell joined the Detroit Symphony in 1972 as assistant principal. In 1978, he accepted the position of principal horn of the Mexico City Philharmonic and began to pursue his solo career. In 1980, he moved to Europe to better pursue his natural horn interests, and performed in Belgium as guest principal horn of the Antwerp Philharmonic/Royal Flemish Orchestra. 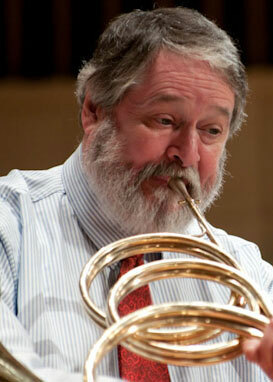 He returned to the US in 1984, where he served as principal horn of the Cincinnati Symphony until 1986. He also performed as principal of the Toledo Symphony from 1990-1997. During this time, he won seven first prizes at six prestigious international horn competitions: Heldenleben (1977), Gian Battista Viotti, Vercelli (1978), Hubertus Jaachthoornfestival (1979), SACEM, Paris (1981), Jacques-Francois Gallay (1981), and American (1983, 1984). As a soloist, Lowell has performed on natural and modern horn with some fifty orchestras in the US, Canada, Mexico, and all across Europe, not to mention his appearances at numerous chamber music venues. His extensive discography includes four CD’s on Harmonium Mundi, including the Mozart Horn Concertos and Quintet, Brahms Horn Trio, and the Beethoven Sonata on natural horn, and a recording for Decca L’oiseau Lyre of the entire music of Mozart for winds performed on original instruments. A dedicated scholar and educator, Lowell has taught at Wheaton College, Oakland University, Interlochen Arts Academy, the School for Perfection in Mexico City, the University of Cincinnati, the University of Michigan, and at the Carl Neilsen Academy in Odense, Denmark. An acclaimed expert on natural horn performance, his research has led him to become a maker of fine reproductions of classic instruments, and he has taught a course in natural horn building techniques at the William Cummings House since 1994. Lowell was honored with the Punto Award at the 2008 International Horn Symposium in Denver, where he led his natural horn group, the Hunting Horns of General Washington.